Cory Doctorow: Filesharing deal will drive swapping underground | Technology | guardian.co.uk – Cory speaks the truth, but underestimates just how painful, protracted and destructive the battle will be. Plenty of Blame to Go Around in Yahoo Music Shutdown – Ed Felten knows who to blame, and I agree with him entirely. Exploit code targets Mac OS X, iTunes, Java, Winzip… – nasty little piece of software called Evilgrade that uses a man in the middle attack to exploit automatic update code. Consultation on legislative options to address illicit P2P file-sharing – BERR – UK government consultation opens..
Google Knol is evil | Seldo.Com Blog – Hard-hitting analysis: is Knol Google's 'IE vs Netscape' moment? I won’t be going to Beijing for the Olympic Games next month, and in fact I probably won’t even be going to London in 2012 when it’s our turn to host the festivities. I don’t watch athletics or any of the other events that will be taking place. I don’t support a football team either, or have much interest in cricket despite being an English male. Sport just doesn’t excite me at all. But even though I don’t care which country wins most gold medals or whether world records are broken for running, jumping or throwing odd-shaped objects, I’ll be watching what goes on around the Olympic Games with keen interest, because this world-wide sporting event offers a fascinating perspective on the state of the internet today. In the last few weeks we’ve seen two very different approaches to the full disclosure of security flaws in large-scale computer systems. Problems in the domain name system have been kept quiet long enough for vendors to find and fix their software, while details of how to hack Transport for London’s Oyster card will soon be available to anyone with a laptop computer and a desire to break the law. These two cases highlight a major problem facing the computing industry, one that goes back many years and is still far from being resolved. Given that there are inevitably bugs, flaws and unexpected interactions in complex systems, how much information about them should be made public by researchers when the details could be helpful to criminals or malicious hackers. On Monday I went to see Clay Shirky talk at a lunchtime seminar hosted by the Demos think tank, travelling in to London earlier than I needed to on a crowded train, sitting on a slow bus across town and then squeezing into a bright but too warm room to sit on a hard seat in order to listen to something which was being recorded and will later be available as a podcast. My most striking realization since getting my iPhone (love it, thanks for asking) is that radio is doomed. Pandora is a wonder, creating my own radio station, live and on the fly without need for a broadcast tower. Spending £700 million on digital switchover is perhaps the most foolish waste of public money since the Maginot Line, and will be as effective in stopping the tide of Internet-based programming that is about to sweep over Europe and the rest of the networked world. Building a dedicated transmission network designed solely to distribute digitally-encoded television over a fixed set of frequencies, so that audio and video can be received by specialised aerials, decoded on single-purpose computers and displayed on screens is an absurd idea when cable companies are already making the switch to IPTV and a general-purpose data network – the Internet – can provide a suitable infrastructure for programme distribution. Freedom to Tinker » Blog Archive » Could Too Much Transparency Lead to Sunburn? 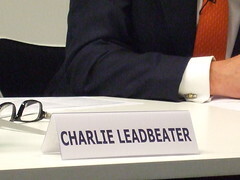 – "As technology evolves, the same public information laws create novel and in some cases previously unimaginable levels of transparency"
Charlie was speaking at the NESTA-organised seminar with Tim Berners-Lee last week. I thought this captured his essence.